Appointments are generally made when children reach the age of three (3). We strongly suggest bringing your child with you to your own dental appointments so that he or she can become familiar with our office and the sights and sounds of a dental office. This will help to ensure that your child has a comfortable and enjoyable experience when he or she arrives for their own check-up appointment. At each of your child's check-up appointments, we will check for proper growth and development and oral health with a tooth by tooth exam. We will also teach techniques for cleaning, brushing and flossing at home. Dental sealants and fluoride supplements are also available. When a primary tooth is lost prematurely, the surrounding teeth can shift into the space causing crowding or misdirected eruption of the permanent tooth erupting into that space in the future. A space maintainer is an appliance, either removable or cemented into place that holds the space between the neighboring teeth, allowing the erupting permanent tooth to take its proper place within the dental arch. 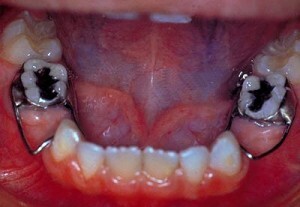 When the permanent tooth erupts correctly, the dentist or orthodontist can then remove the space maintainer. Fluoride treatment is an application of fluoride that helps to strengthen the teeth by penetrating into the outer surface of the tooth enamel, making the teeth more resistant to decay. Topical fluoride can be received also by using dental products containing fluoride such as toothpaste, mouth rinses, and gels. Fluoride varnish highly concentrated form of fluoride that lasts longer than topical fluoride and assists with tooth sensitivity. Fluoride helps the smooth surfaces of the teeth the most. It is less effective on the chewing surfaces of the back teeth, but regular brushing with fluoride toothpaste also helps prevent tooth decay. Sealants and fluoride together can work together to prevent tooth decay. Sealant is a thin, plastic coating applied to the chewing surface of molars, premolars and any deep grooves (called pits and fissures) of teeth. Teeth with these deep grooves are hard to clean and are prone to tooth decay. An application of a sealant protects the teeth from decay, creating a smooth surface easy for cleaning. Sealant can protect teeth from decay for many years, depending on type of sealant material used. However, it needs to be checked for wear and chip at regular dental visits. While cavity prevention starts with a healthy diet, brushing twice a day, daily flossing, and regular dental checkups, sealants can offer additional protection against tooth decay. Sealants are thin, plastic coatings painted on the chewing surfaces of the back teeth (premolars and molars). This clear, plastic coating bonds into the depressions and grooves (pits and fissures) of the chewing surface effectively sealing out the decay-causing bacteria, and reducing the risk of cavities and tooth decay. The application of sealants is easy, painless, and takes only a few minutes to complete. 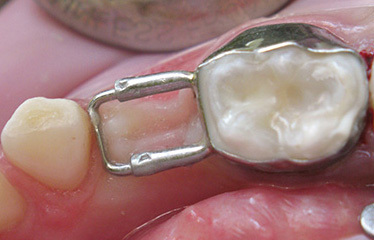 First, the tooth is thoroughly cleaned and then etched with a solution to help the sealant adhere to the tooth. The sealant is then 'painted' onto the pits and fissures, where it bonds directly or is hardened with a high-intensity light. Sealants usually last several years before a reapplication is required. Your dentist will monitor your sealants during your regular checkup. Although children and teenagers will benefit most because they have the highest incidence of pit and fissure decay, adults with difficult to clean molars or wisdom teeth may benefit, as well. Ask your dentist if sealants can help with your preventive care.